Bombay (now known as Mumbai), the capital of Maharashtra, is located in western India. Owing to its location and the mark, the British left on the city, it has changed from a literally isolated town into a major business city with the population of over a million. Recently, the administration changed the city’s Anglicized name Bombay into Mumbai. Mumbai is still a must for travelers and is, to a definite extent, a match for cities like Paris and London. Bollywood or the Bombay Film Industry in Mumbai creates over 400 films a year and is one of the biggest film industries in the world. The actors enjoy a high-flying lifestyle and live in exclusive mansions in Pali Hills and Juhu, the areas that are no less than Beverly Hills. While not many people are allowed to see film shooting, tours to the film studios are carried out and if that does not work there is a place where one can immerse in the typical concoction of Indian dance, songs, discretionary fighting and melodrama. There are plenty of interesting things to experience and do in Bombay beside this which can be experienced during your Sightseeing Tour of Mumbai. There are Museums, like the Gandhi Museum, art galleries, and bazaars like Crawford Market Area, Parks and temples. Even the existing malls are value visit. Especially in the Hutatma Chowk Area, one can see a large concentration of striking and important historical buildings like the fabulous Town Hall in neo-classical style. Marine drive near the seaside is also called the Queen’s Necklace because of its sparkling nightlights, is a nice area to wander and rest in the evening hours. However, Bombay is more famous for ‘Gateway of India’. This iconic landmark memorial was built to honor the visitation day of King George the V and Queen Mary in the year 1911. Simultaneously, it is the place where one can catch a boat to the Elephanta Island, a UNESCO world heritage site a place where people can see some stunning rock-cut temples and caves that go back to the 6th century. Day trips from Bombay comprise visits to the Kanheri Caves at Borivli, Bassein to see its Portuguese Fort and Cheul to see ruins of Muslim and Portuguese Forts. From Bombay, visit Ellora and Ajanta. Do not miss the various food outlets like the numerous restaurants and roadside eateries. Specialties include Vadapav, Bhelpuri, Paanipuri, Dhabeli, Masala Papad and various other local foods. Traveling in Bombay is planned by the time it takes to reach a destination and not by the kilometers, which are the ‘standard’ everywhere else. 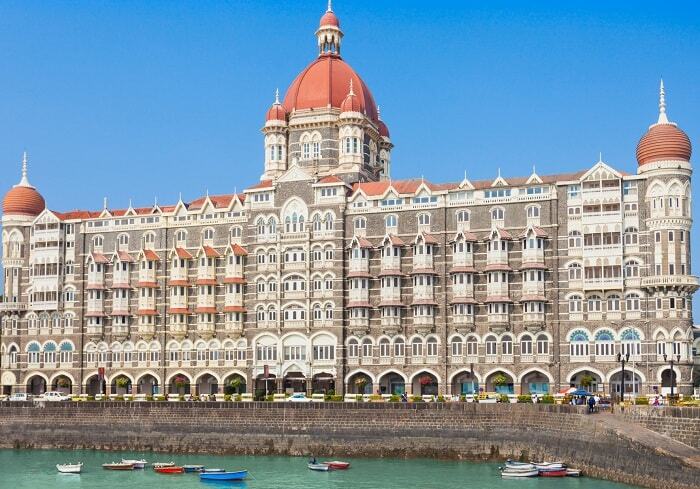 Bombay is home to a number of low cost, mid-range as well as star-rated hotels. Enter into a distinctive lifestyle at Le Royal Meridien Bombay where hospitality blends with stylish ambiance and superior service values. 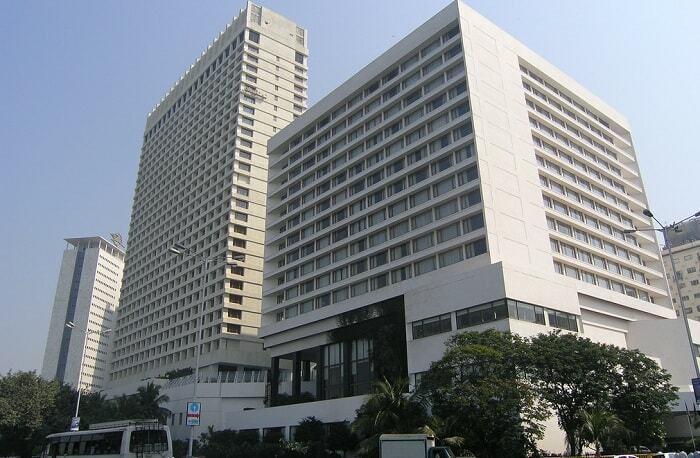 Le Royal Meridien Mumbai is situated close to the international airport in the new commercial hub of Bombay. The colonial era, recreated in an exclusive style by international designers, is supported with an abundant amount of brand new age technological innovations. 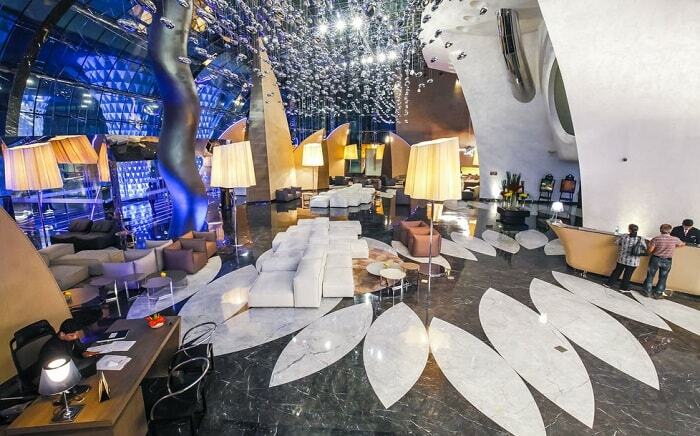 Le Royal Meridien Bombay is an avowal of elegance and vibrancy. The hotel is an exceptional architectural marvel, which holds a glass curtain exterior, atrium lobby and comfortable and stylish capsule elevators. The large, splendid rooms offer a spectacular city view. Airport is at a distance of 2 km , Railway Station-6 km, Bus Station-0.5 km, and City Centre, a distance of 12 km from this hotel. Holiday Inn Bombay is perfectly located at the Juhu Beach, at a few minutes distance from the Domestic and International Airports. 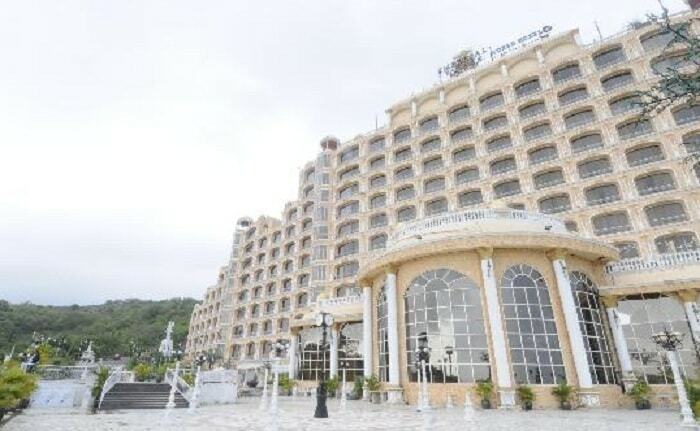 This hotel is situated at just a small and comfortable drive away from the Central Business and Industrial Districts. It is also located extremely close to the shopping areas, therefore catering up to the satisfaction of both a business as well as a tourist spending some vacation. The Taj Mahal Hotel is home to an old-world Heritage Wing and a modern tower wing offering a total of 582 rooms that includes a club floor and 49 suites. Taj Land’s end which is close to the Bandra-Kurla, Andheri and Worli commerce districts is located 12 kms from the international and 8 kms from the domestic airdrome. Hilton Towers is centrally situated on the marine drive within the business and shopping district of Bombay. 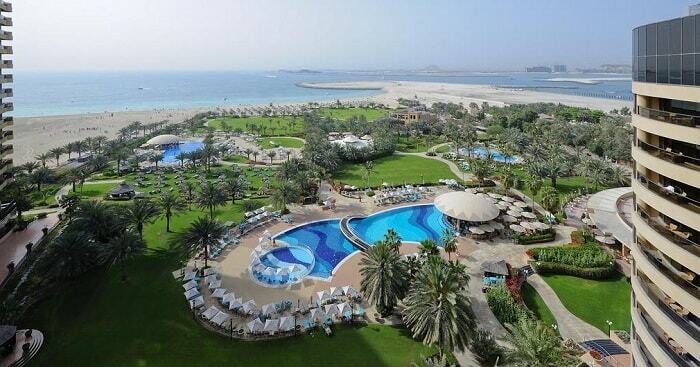 This hotel offers stunning views of the Arabian sea from the room which offers luxurious rooms and suites. This generous and spacious hotel with 223 guest rooms and suites is located amidst 240 acres of abundant, green wonderfully landscaped and lush surrounds. The hotel’s splendor blended with Indian mysticism epitomizes hospitality and stands intensely rooted in Indian traditions and culture. This super deluxe hotel has a tall eight-story entrance hall lobby with a grand staircase and a majestic mural within its heights. Chhatrapati Shivaji Terminus – Previously named Victoria Terminus, it is the headquarter of the Western Railways. Gateway of India – Bombay’s principal landmark is the Gateway of India. It is a huge archway on the edge of sea at Apollo Bunder. Marine Drive – Marine drive is laid on the shoreline of the Arabian Sea from Nariman Point past Chowpatty beach to the foot of Malabar Hill. Haji Ali Mosque – The majestic whitewashed mosque is placed 500 yards into the sea and can be reached only in low tides. The Mosque was built to honour the Muslim saint Haji Ali. In the high tides, the linking walkway gets flooded into water creating the illusion that the holy mosque and the tomb are floating on top of water. Juhu Beach – Juhu beach is ranked among one of the most popular beaches of India. It is moreover one of the most posh localities of Bombay and home to many famous film personalities. Chowpatty Beach – Chowpatty beach is one of the main tourist attractions of Bombay and the site of many religious ceremonies. Flora Fountain or Hutatma Chowk – This fountain located in the mind of the city was erected in 1869 in honor of a British Governor of Bombay. Malabar Hill – Situated in the northern cape of Back Bay is the posh residential area of Malabar Hill, favored for its cool breezes and fine bay views. Hanging Gardens – It is also famous as Pherozeshah Mehta Gardens. The Hanging Gardens were made in 1880 and were renovated in 1921. Kamla Nehru Park – Kamla Nehru Park is adjoining to the Hanging Gardens and is situated on the Malabar Hills. Rajabai Clock Tower – Rajabai Clock Tower, situated in the gardens of the famous Bombay University Building rises above the section of the library part. Mumbai Fort – The area north of Colaba is known as Bombay Fort, due to the fact that the old British fort was once situated here. Sanjay Gandhi National Park – This large cosseted area of woody hills on Bombay’s northern outer edge is known for the 109 Kanheri caves, which line the side of a rocky narrow valley in the center of the park. Essel World and Water Kingdom – Essel World is an internationally themed park and an amusement center located close to Gorai Beach. Ideal for a one-day holiday, Essel World offers over 40 thrilling rides, games, and attractions. The Water Kingdom is supposed to be the largest of its kind in Asia. Reaching Bombay is not difficult. Since Bombay is known for being the business capital of India, it is very well linked, both nationally and internationally. Depending on choice one can travel to Bombay by air, by rail or by road. Air – Bombay has the busiest air set-up in the country and all major airlines fly to and from Bombay to most of the important cities of the world. There are different terminals created for both international and domestic flights. Rail – Bombay is a major railway hub of the country. It is the headquarter to two railway zones, i.e. Central and Western. Central Railways handles services to the East and South, Western Railways caters to the North from Church Gate and Bombay Central Stations. Road – Bombay is well linked to all major cities of the nation through a large network of highways and expressways. Being a coastal city, Bombay experiences moderate climatic conditions throughout the year and there isn’t any change in the temperature conditions all year long. Due to its nearness to the sea the weather stays humid all through the year. Summers – The summertime in Bombay starts from April to mid-June. The weather is hot and humid. The maximum and minimum temperatures range from 35°C and 25°C respectively. Monsoon – Monsoon season begins from mid-June and expands up to mid-September. It rains very heavily in Bombay. Annual rainfall in Bombay is around 200 cm. The temperature during the day and night time ranges around 30°C and 20°C respectively. Winters – Winter season begins from November and lasts till February. The weather is pleasing and the temperature is in the range of 15 and 25°C.